Luxetips Events! BET Awards Show Weekend In L.A. At The Ford Hot Spot! « LUXETIPS! | Every Woman Deserves To Live The Luxe Life! Luxetips Events! BET Awards Show Weekend In L.A. At The Ford Hot Spot! Disclaimer: Ford Motor Company sent me to the #FordHotSpot to cover the activities in their social media lounge at the 2013 BET Awards”. As I write this, I am on my way to Los Angeles to cover the 2013 BET Awards Show as an exclusive media guest of Ford Motor Company. Yes, I am pinching myself. Ford has partnered with BET Networks for the sixth consecutive year to sponsor the red carpet and #FordHotSpot. As a media guest of Ford, I will have an opportunity to cover the #Ford Hot Spot and have exclusive access to cover the red carpet and the #Ford Hot Spot on Sunday, June 30th the day of the show. And you better believe I will bring you all the REAL TIME behind the scenes action LIVE from the #Ford Hot Spot which is hosted this year by Toccara. Of course, I will be sure to find out what designers the Stars are wearing and of course discover how the celebs are rocking the latest beauty trends. Ford is also giving one lucky viewer the opportunity to win a VIP experience at the 2013 BET Awards as part of Ford’s “Rolling With Ford AND The BET Awards Contest.” The winner of the contest will take part in a VIP Experience during this year’s awards show and will also appear live during the “106 & Park” BET Awards Pre-Show on Sunday, June 30. Of course the all new 2013 Ford Fusion will be my ride during the BET Awards Show weekend and I will once again get a chance to test drive the vehicle. 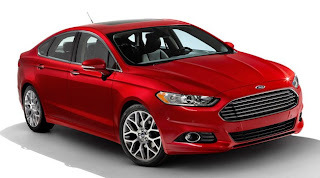 I have test drove the Ford Fusion on two occasions and it is a super techy and fun car to drive. Plus it looks good! Be sure to follow me @luxetips on Twitter, @luxetips on Instagram and on Facebook to get all the deets on the action as it happens. Also follow the hashtag: #fordhotspot to get all the live coverage during the 2013 BET Awards Show Weekend.